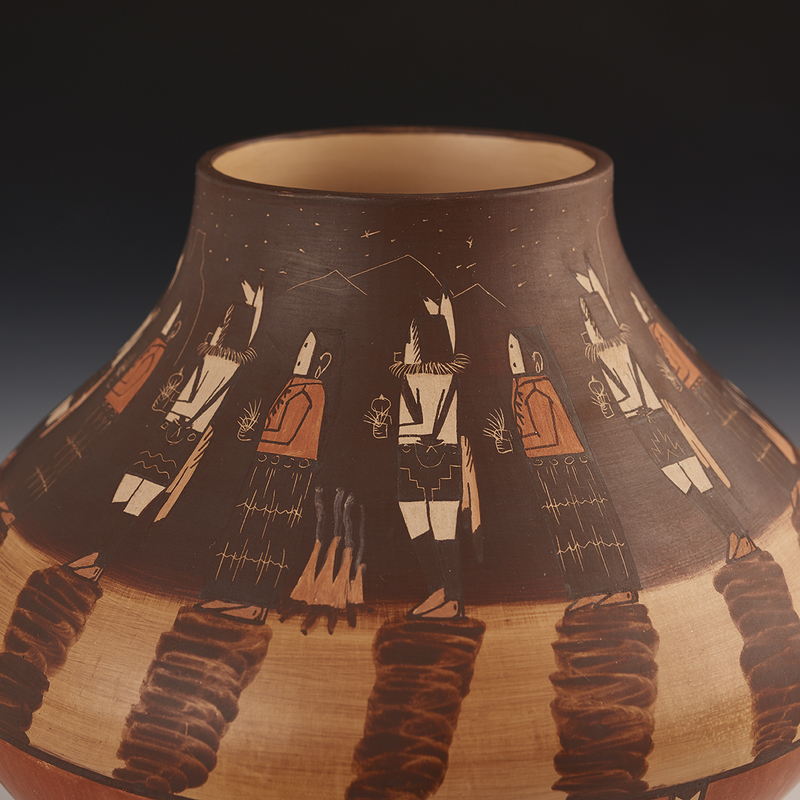 Ida Sahmie has been making pottery since the early 1980s and is most recognized for painting her pottery with the Navajo Nightway Chant figures. In this Navajo healing ceremony, there is a ceremonial dance on the last of nine nights; it is called the Yei-be-Chai. In this dance, six male and six female dancers are led by “Talking God,” the chief god, and followed by “Water Sprinkler,” the trickster and rain god. This is the motif portrayed on this jar. 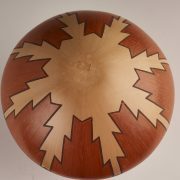 Ida is married to Hopi wood carver, Andy Sahmie. 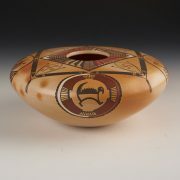 Because of her husband, she uses Hopi clay; so, her work is what you might call a mixture of Hopi and Navajo. This is a beautiful shaped jar, with such a complete story she is telling. This beautiful jar was made in 1999. Ida Sahmie was born near Pine Springs, AZ in 1960. She was raised in a traditional Navajo family: she learned to weave from her mother and grandmother but she didn’t think she had the patience to be a real weaver. Then in the mid 1980’s she married Andrew “Louie” Sahmie. He was Hopi so Ida moved into his home on the Hopi reservation. Her mother-in-law was Priscilla Namingha, a well-known potter and descendant of the famous Hopi potter Nampeyo of Hano. Ida observed Priscilla making pottery and was moved by her beautiful work. Shortly, Priscilla was encouraging Ida to make some pots. Ida started out making small pots which she fired along with Priscilla’s work. 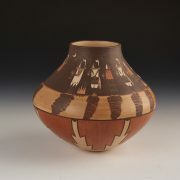 Her first painted designs were simple Hopi-based patterns. She soon realized she needed to come up with her own designs based on her Navajo heritage. Navajo sand painting designs were a primary inspiration for the images Ida paints on her pots. As some of those are sacred images they need to be depicted exactly as tradition requires. Other images required that Ida have a Night Chant ceremony performed first, then it would be safe for her to depict the figures. She prefers to dig her clay on the Navajo Reservation. She uses a mix of natural white and yellow clays that result in a peach colored body, a background that best shows off her designs. She often mixes a little of the white clay with wild spinach to create the softer black slip used in some of her images. The pots are fired outside in the traditional way (with ash and sand), then the pile is mounded over with sheep manure to create an intense heat. The firing process can take all day and can only happen when the weather is just right. 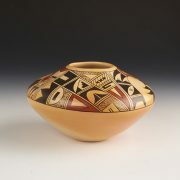 Her combination of Hopi pottery techniques and painted Navajo designs makes her pottery truly unique. “Personally, I feel I have a unique talent with pottery. It’s a combination of both Hopi and Navajo, though I feel it should be more Navajo because I am a Navajo,” she notes in Fourteen Families in Pueblo Pottery. Her work is in the collections of the Smithsonian and the Dallas Museum of Art.